"If you are like many healthcare facilities, eliminating pre-powdered surgical gloves in the O.R. is a top priority. GloveSaver.com has a full range of powder-free gloves and the experience to help you achieve your goals. All of GloveSaver.com powder-free gloves have a proprietary inner polymer coating which allows for easy donning and double gloving. 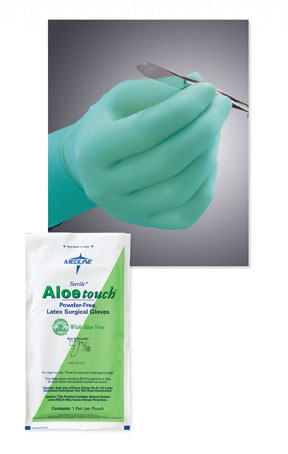 The Aloeouch®, powder-free, latex surgical glove is a standard thickness glove perfect for all general procedres. Inner coating of pure Aloe Vera helps moisturize and soothe dry, irritated hands. This low protein glove has an enhanced fit and grip as well as a powder-free beaded cuff reinforced to resist tearing."